"The witch and her cat are happily flying through the sky on a broomstick when the wind picks up and blows away the witches's hat, then her bow, and then her wand! Luckily, three helpful animals find the missing items, and all they want in return is a ride on the broom. 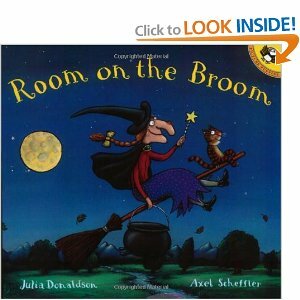 But is there room on the broom for so many friends? And when disaster strikes, will they be able to save the witch from a hungry dragon?" "What's going on in the pumpkin patch? Well a very unusual pumpkin has hatched. While all the others are round, Spookley is square. He's not like his friends-they have curves, he has ends. And everyone teases him, night and day. But just before Halloween, the weather turns stormy. 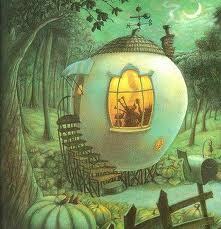 Winds toss the round pumpkins to and fro, and off they go, crashing and bashing and smashing--except Spookley. Can he, with his square little body, save the day? A delicious story about how being different can be good." and hangs my favorite bat above me. That's how I know my mama loves me!" "This amusing love poem will delight preschoolers and their mothers as they enjoy the rhyming story and pore over the detailed illustrations. 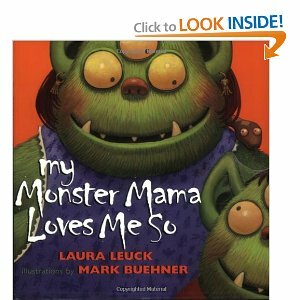 Little monster tells readers the many ways his mama shows that she loves him: she attends all of his "beastball games"; sings him lullabies and tucks him into bed; and "She gives me great big hairy hugs, bakes me cookies filled with bugs, and when I'm sick she's twice as nice- she gives me lizard juice with ice." ...Buehner's three-eyes monsters live in a haunted house that includes a one-eyed dog, spiders over the bed, and cobwebs everywhere, yet they manage to look both friendly and monstrous at the same time. Details such as bug earrings and a blue, hairy beastball with eyes and fangs, as well as ordinary children as the "scary things" that frighten little monster, are sure to tickle young funny bones." "Deep in the woods in an old white cabin, three friends make their pumpkin soup the same way every day. The cat slices the pumpkin, the Squirrel stirs in the water, and the Duck tips in just enough salt. But one day Duck wants to stir instead, and there is a horrible squabble, and he leaves the cabin in a huff. It isn't long before Cat and Squirrel start to worry about him and begin to search for their friend. 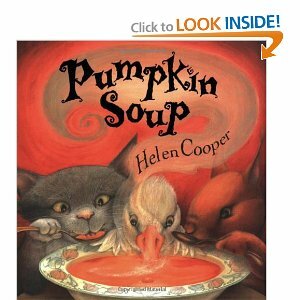 Rendered in pictures richly evoking autumn, Helen Coopers's delightful story will resonate for a child who has known the difficulties that come with friendship. 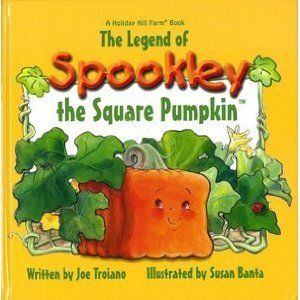 Included at the end is a recipe for delicious pumpkin soup." Cute little home in the forest. Autumm at is best.... can you spot the duck? Duck, cat, and squirrel fast alseep. "Little monsters and goofy goblins take center stage in this silly, spooky spin on Clement C. Moore's beloved poem. 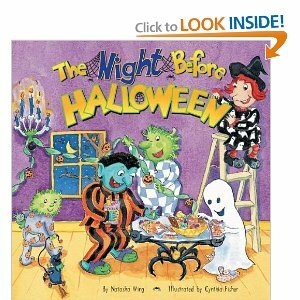 But what will happen on Halloween when the monsters come face to face with human trick-or-treaters in this fun-filled book by the author of The Night Before Easter?"